Do you have a home in an area where extreme cold is likely during the winter months? Don’t risk thousands of dollars in plumbing repairs… take the time to protect your pipes from bursting. When water freezes in your pipes, the ice expands, adding to the overall pressure in your home’s plumbing. When this force builds, it can cause pipes to split. In addition to plumbing repairs, you might find yourself on the hook for flooding damage, too. The pipes most at risk? Those exposed to the lowest temperatures, of course. This includes plumbing on the exterior of the home, in exterior walls, and exposed pipes in those unheated zones of your home. 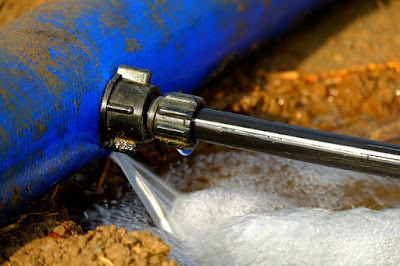 Did you know that even a frozen garden hose can cause enough pressure to split an interior pipe? Be sure to disconnect and drain them. Faucets outside are vulnerable as well, so you’ll want to locate the shutoff valves for those spigots and make sure they’re drained before a freeze. Naturally, if you’re not going to be around for the winter months, you’ll want to prepare your home before you head to a warmer climate. Don’t let the house drop below the mid-50s, and shut off the water main and be sure to drain the home’s plumbing by letting the faucets run to empty and flushing the toilets. Get the taps running. You don’t need a rushing stream of water, just make sure indoor and outdoor faucets are letting a steady drip out to keep the water moving. Open up closed spaces. Have an unheated garage? Pipes in cabinets? Get warm air circulating in there by opening them up to climate-controlled areas of your home. The added heating expense is nothing compared to costly repairs. Insulate pipes. If you suspect the pipes are starting to accumulate some ice, you can try hot towels (soaked in hot water) to loosen the frosty slush in the pipes. Hair dryer to the rescue. When hot towels won’t help, don’t hesitate to get out your trusty hairdryer or heat gun to thaw things out. No open flames, though!